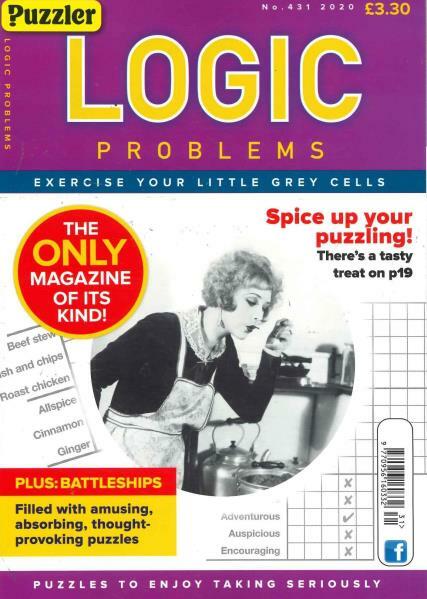 Logic Problems is “The First and the Best” Magazine for over 20 years and is still as popular today as it was then. Buy a single copy or subscription to Logic Problems magazine. It offers the reader an abundance of the finest logical puzzles around. No expert knowledge or memory skill is needed to complete the problems, which can be easily followed and assistance is on hand with guidance and clues. It also includes a variety of popular puzzles such as Killer Sudoku, Logic-5, Hanji, Battleships, Domino Search and Enigma. issues. Order your subscription to Logic Problems Magazine now. This is a great puzzle book, dedicated largely to one type of puzzle so you would only purchase it if you were a fan. My favourite magazine is : Logic Problems It keeps me occupied for hour after hour, and I get a great sense of achievement when I get the puzzles right.